putting stroke takes from start to finish. The objective of any putting tempo is to maintain an even back and forth rhythm. There are a number of putting aids that can help you develop a smooth putting stroke. Different golfers have different tempos, but the tempo of most golfers is generally too quick. This is because they interfere with the natural acceleration of gravity by rushing their downstroke and jabbing at their putts. Suspend a weight from a crossbeam with a length of string. Pull the weight back a few feet and then let it go. Observe how the weight swings back and forth with an even tempo. Note how, irrespective of the length of the backswing, the total time from top of the backswing to the top of the forward swing never changes. You should swing your putter back and forth with the same timing for all putts based on your personal tempo. Irrespective of the length of your backstroke, the total time of your putting stroke should remain the same. To learn how to execute a pendulum-like stroke that is smooth and rhythmic where ideally the backstroke length is equal to the follow-through length. 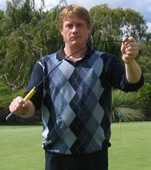 There are a number of putting aids that will help you to achieve a smooth and rhythmic putting stroke. A simple device that clamps to your putter shaft. It has a large and small dimple on its flat base for resting a golf ball. Designed with the two levels of difficulty, it helps you to master a jerk-free putting stroke. Any unevenness in your action will dislodge the golf ball. These are putters with a super-flexible shaft. The objective is to keep the shaft as straight as possible, only allowing the slightest bend in the shaft on the change of direction between the backstroke and forward stroke. A smooth stroke back and forth will provide a straight shaft and a well-controlled putt, while a poor stroke will provide a visibly snagged shaft and a wayward putt. To putt consistently you need to have an even tempo. The drill is to place a small coin on your putter head and swing your putter back and down into impact without the coin moving or falling off. You can only do this if you have a smooth transition from backstroke to forward stroke and a constant rate of acceleration. Each putting aid has the same objective. To help you feel and execute a smooth putting stroke without a jerky and violent transition of direction on the downstroke. With each putting aid you will get constructive feedback on how well you are achieving your objective. Without a smooth rhythmic stroke with an even putting tempo, your golf ball will fall off the Stimpdimple, the flexible putter will snag, and the coin will move or fall off your putter head.